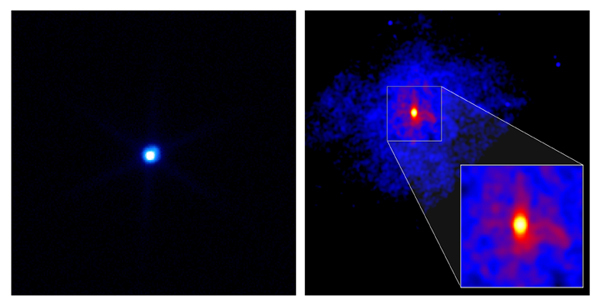 Chandra observations of RX J1856.5-3754 and the pulsar in 3C58 suggest that the matter in these collapsed stars is even denser than nuclear matter, the most dense matter found on Earth. This raises the possibility that these stars are composed of free quarks or crystals of sub-nuclear particles, rather than neutrons. By combining Chandra and Hubble Space Telescope data, astronomers found that RX J1856 radiates like a solid body with a temperature of 700,000 degrees Celsius and has a diameter of about 7 miles. This size is too small to reconcile with the standard models of neutron stars. 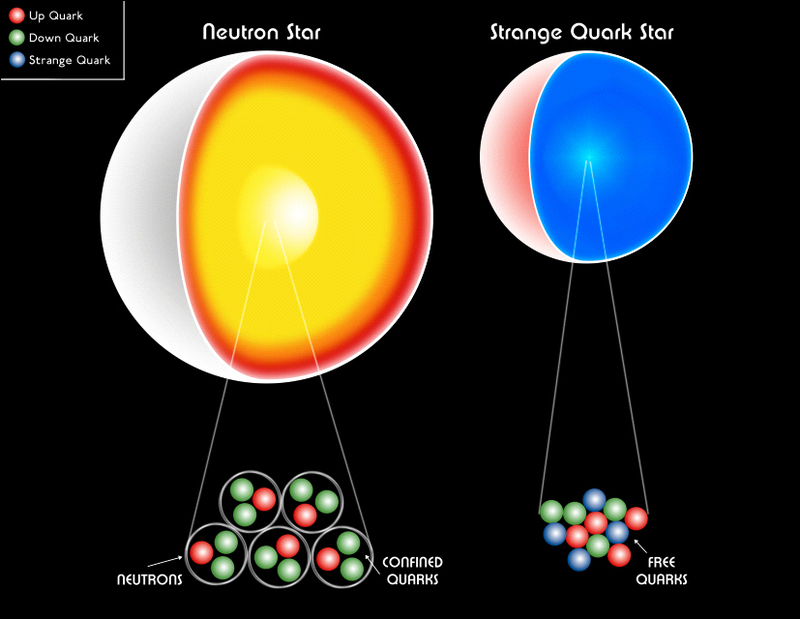 One exciting possibility, predicted by some theories, is that the neutrons in the star have dissolved at very high density into a soup of "up," "down" and "strange" quarks to form a "strange quark star," which would explain the smaller radius. Observations of 3C58, the remnant of a supernova noted on Earth in AD 1181, reveal that the pulsar in the core has a temperature much lower than expected. This suggests that an exotic, denser state of matter might exist inside this star as well. These observations demonstrate that the universe can be used as a laboratory to explore physics under conditions that are not accessible on Earth. Scale Image is 20 arcsec on a side. Coordinates (J2000) RA 18h 56m 35.3s | Dec -37° 56' 34.40"
Scale Image is 7.2 arcmin on a side. Coordinates (J2000) RA 02h 05m 37.00s | Dec +64° 49' 48.00"